SQM (NYSE; US$10.4b market cap) last month announced its intention to buy-in to Kidman’s world-class Mt Holland (MH) project. SQM has confirmed it will develop MH as an integrated spodumene-refinery project, developing both the upstream mine and concentrator operation (essentially fully funded by SQM) and with a local downstream refinery. By way of background, Kidman’s MH project boasts a world class hard-rock Lithium resource of 128mt @ 1.44% Li2O with high-margin orebody attributes, and in close proximity to existing underutilised infrastructure. Ideally located in Southern WA on existing granted mining leases, and amid a multi-year Lithium bull market, we were excited by the strategic nature of the MH asset and in turn its emerging value. MH is the biggest and best undeveloped hard-rock lithium resource globally, and importantly, can economically supply a high value-add local downstream refinery to produce Lithium Carbonate &/or Lithium Hydroxide, both being key products of our Electric Vehicle thematic. 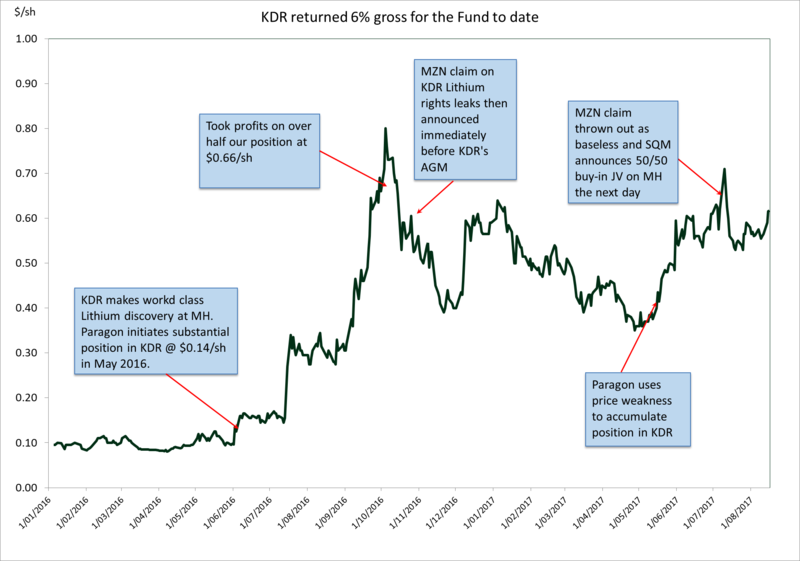 Kidman management had cleverly not given away their project's offtake rights to Chinese downstream players, and instead pursued the higher value-add strategic path. SQM is a Santiago-based world leader in specialty chemicals including Lithium, solar salts, potassium nitrate and iodine. SQM has an impeccable production and development track record, boasting a strong balance sheet with ample funding capacity (EBITDA of ~US$1b pa; ~50% derived from Lithium production). Importantly for Australian institutional investors, unlike many Chinese competitors, SQM does not come with high counterparty risk. We view SQM as an exceptional project partner and the terms of the deal as solid. The initial market reaction to the MH JV was surprising, with pundits misunderstanding the merits of the deal. However, there was similar price action in 2012 when Orocobre sold 25% of its Lithium project to Toyota and in 2016 when Lithium Americas Corp sold 50% of its Lithium project to SQM. Both stocks were initially sold down ~30% before more than doubling and the market realising the benefits of having a fully funded solution with a tier 1 project partner. The Kidman-SQM JV now places the MH project as one of only two integrated spodumene-refinery projects; both based in WA. The other being the 51%/49% JV between Tianqi (US$9.5b market cap) and Albemarle (US$12.8b market cap), who own and operate the Greenbushes spodumene mine, and currently are building a local refinery in Kwinana WA. Every other upstream spodumene competitor ship their ~6% lithium concentrates from WA to China to be converted in Chinese refineries into lithium carbonate or lithium hydroxide – logistically sub-optimal and at a higher cost. The integrated model offers materially higher NPV’s than traditional spodumene-only concentrate operations. This is evidenced by the materially higher multiples the integrated players trade on - Tianqi & Ganfeng trade on >25x 1yr fwd EBITDA / Albemarle ~16x 1yr fwd EBITDA vs spodumene-only peers ~6x 1yr fwd EBITDA. The MH integrated spodumene-refinery project boasts NPVs ranging from $2b to $4b on a 100% basis (range subject to our macro and operating assumptions), or $1b to $2b for Kidman’s 50% share of the JV. This implies that Kidman is currently trading at 10-20% its MH integrated NPV. Our experience in these high-quality resource development investments suggests that Kidman should re-rate to at least 50% of its MH JV NPV in the short-term - upon reaching its funding and construction commencement milestones - hence offering strong asymmetric risk-reward to the upside. Great article! It's seems very Lively in the Lithium space.